[ “It’s very sad to let you know that Bapin’s pet daughter Dinah passed away on October 14th, 2008. I am saddened to report that Dinah has left us. She collapsed at 3:45 PM as my co-worker James Feldmann was trying to make her stand up from her bed under his office’s desk. She would not stand up and needed to be lifted onto a cart by two other colleagues, John Baroncelli and Robert Pena. She was taken to Robert’s car and driven away to the Animal Medical Center in NYC. The doctors found that the fluids in the sac around Dinah’s heart filled up again. They had to flush out the fluids but 15 minutes later the fluids filled up fast. There was no other option to curing the tumor and Dinah’s primary doctor recommended to have her put down. James and Robert were at the hospital with Dinah and I was in my office here in San Francisco. I was on the phone with the doctor with an interpreter and we talked for a long time. We all decided to let Dinah go at 6:30 PM. The young deaf-blind man on the jet about to take off from Detroit Metro leans downward in his bulkhead seat and vigorously strokes his yellow Labrador retriever. Passengers and flight attendants smile and whisper comments of compassion for a man and dog traveling alone and now, for the first time, entrusting life and limb to the extraordinary adaptation of each others’ limited senses. But no one knows the story about this man with the long-bill denim cap at whom they’re stealing glances. He is 27-year-old Anindya (Bapin) Bhattacharyya, who two nights ago was “telling” members of the Rochester (Michigan) Hills Lions Club about having just graduated from the University of Arkansas with a major in political science and now offered a job in the governor’s office as a policy analyst for disabled people. Bapin was also relating a few amazing chapters from a life dramatized with pain, incredible perseverance, spiritual faith, and a leap in emotional maturity. The Lab dog at his feet on the jet was Dinah: 21 months old, 64 pounds, expressive, obedient. She too had a poignant story. Together day and night, the two that week had just completed 24 days of regimented training at the Leader Dog School for the Blind in Rochester, Michigan, reportedly the only school in the United States with a specialized program that trains deaf-blind people to walk freely and not be constrained to only one walking route. With Bapin during the training had been Kenneth Sting, a 55-year-old machinist from Seattle whose trip to Rochester had been arranged by the Seattle Capitol Hill Lions club. Rigors of this unique training limit it to two or three students for any one instructor. Bapin’s climatic events last June as both a university graduate and new master of a prestigious Leader dog would have appeared impossible two decades ago. He was born deaf in Telari, India, south of Calcutta. Nine years later he was blinded by a fellow rugby team mate who, jealous of Bapin’s appointment as team captain, scooped up hot ashes from a fire one day and threw them into Bapin’s face. Instead of devastating Bapin for life, the incident forged him and his father, a high school math teacher, into a goal-oriented father-son team. His father taught him to speak, a difficult feat for any deaf person. For four years the family searched unsuccessfully in India for a school for their deaf-blind boy who spoke only broken Bengali. Eventually Bapin was accepted by a school for the blind in Calcutta. “I wanted a companion” . The jet turboes whine louder for takeoff, and Bapin waits as anxiously as he did that afternoon three weeks ago when he and Ken stood erect in their dormitory room waiting to meet their dogs for the first time. Keith walks in the first yellow Lab, Skinner, and hands the leash to Ken, whose hands immediately feel for the dog’s features. Uttering sounds of unmistakable joy, Ken begins to unceasingly pet his new friend. Then Ken leaves and returns with Chica and gives her to Bapin. It is Bapin’s first dog, his very first pet ever. (This will later become a problem.) Bapin reaches for the Lab’s tail, as if to make sure it is wagging. It is. Ken and Bapin are left alone. The moment demands it. That night Kenneth and Bapin go to bed with Skinner and Chica chained to a wall a few feet away. Bapin soon gets up and moves his bed within inches of Chica. The next morning he complains boastfully to Kenneth that he didn’t get any sleep because of Chica licking his face. “It’s a very heartening experience having a new companion to share my life with,” Bapin says.” I know Chica will love being my guide as well as receiving my loving in return. I’m looking forward to developing a strong dog and see how it grows up just by hanging by me.” But sadly, it wouldn’t be Chica. The school at Rochester carefully matches master and dog according to each other’s temperament, size, and walking speed. For example, the large, 17-month-old, 79-pound Skinner – a somewhat mellow male – was given to Ken, a stocky, reserved man. Chica, 59 pounds of face-licking energy, went to the extroverted, light-weighted Bapin. But the all-important bonding between the two men and their dogs is a slow and – for the dogs – wrenching process. Chica and Skinner during their recent eight months of “pre-student” training, had become naturally attached to their trainer, Keith. Still, the Labrador retriever, unlike the German Shepherd, which is no longer the school’s majority breed, is the preferred Leader dog because it readily adapts to a new master. Both Bapin’s and Ken’s dogs were “recruited” from the school’s puppy program whereby people are given a young female dog which they later bring back for breeding. The female is whelped in the volunteer’s home and the litter brought back to the school for careful screening and eventual placement with blind students. A Leader dog cannot be striving for human attention, aggressive towards other dogs, too strong to be controlled, nor afraid of traffic or walking up and down fire escapes. They are also screened for their resistance to being spooked by surprise situations or threatening objects, such as the life-size lion statue which has tested many a dog in front of the school’s administration building. Students are screened in their homes by Keith, who makes sure they are legally blind, can walk with a cane, are physically and mentally competent to take care of a dog, and financially sufficient. If deaf, they also must be able to sign. Training for Bapin, Ken, Chica, and Skinner begins shortly after 6 a.m. when the dogs are taken to an outdoor run to relieve themselves. At breakfast with 22 blind students (several from Spain), Bapin and Ken chat with Keith about the upcoming training day. More than a dozen Labs are stretched out calmly at their masters’ feet. An hour later, a training cadre of 72 men and women attired in khaki shorts and “Leader Dog” shirts maneuver students and dogs out to the 14-acre school complex; this is done gently yet with the precision of military drill under the overall direction of Bill Hansen, a retired Air Force colonel. Except for meals and some R&R time with Chica and Skinner, Bapin and Ken train until the conclusion of a lecture at 8 p.m.
Bapin, Ken, and the dogs learn hand signals: “forward,” “left,” “right,” “sit,” “down,” “stay,” and “walk faster.” Leader dogs learn to guide their masters away from oncoming cars, construction zones and other dangerous obstacles. They are not trained to listen for telephones or door knocking, for which most deaf-blind people have electronic devices. Chica and Skinner have one job: to guide. Trainer, student, and dog each have a special challenge during the training. For Keith, it is to teach the dog “a sense of responsibility” for its master; for Bapin, it is learning to cross a traffic intersection; and for the dog, it’s leading its master away from objects that overhang their walking route. It is critical and often painfully slow for master and dog to learn what to expect from each other. Do Chica and Skinner know that their masters are deaf and blind? Keith doesn’t think so. He believes the dogs, after working with their masters for a year, know something is different about this particular human yet are responding to only what they have been taught. Everyone rests on Sunday. Students may go to church, but without their dogs. Keith rests a painful shoulder and arm from the constant stress of Bapin and Ken using his outstretched palm as a notepad for some of their hard-pressing signing. Occasionally the pain forces him to use an assistant interpreter. The school, with its six task-busy buildings, has grown quite a bit since its one-farm-house operation in 1939. There were no Leader dogs for the deaf-blind in 1981 when Keith joined the kennel staff. Then one day eleven years later, he got the urge to ask a deaf-blind student how many people like her in the United States needed a Leader dog. The demand was awesome, she replied, but no school would accept a deaf-blind student because there were no dog trainers who could sign. So, Keith McGregor, then 30 years old, started taking college courses in the sign language unique to deaf-blind people. Today, married with three children and a German Shepherd (“Valentine”) who has whelped 20 puppies for the school, Keith is earning a “deaf studies” degree at Mott Community College in Flint, Michigan. Among trainers at the estimated 14 guide dog schools in America, Keith is likely the only Leader Dog trainer in the world who is skilled with tactile signing. His commitment to his work, he says, arises from the commitment and bonding he sees between master and dog in the homes of students he visits later. Six days into the training, Bapin is confronted with one of those life-changing crises which, depending on a person’s response, is either a blessing or curse. Chica was refusing to lead. Perhaps, Keith thought, she was over-reacting to the strangeness of human deafness; perhaps the dog was still completely attached to Keith, with whom the dog had naturally bonded during the five months of training before Bapin arrived. Bapin becomes stressed. Some of it comes from worrying if he has passed his final college exams for graduation this month. The malfunction in his PC adds to the stress. But a more serious issue emerges: Chica is Bapin’s very first experience with any dog! Having a dog so close to him all the time is behaviorally and emotionally alien. Bapin is never quite sure what Chica is doing on the leash; he expects her to walk in a straight line like a robot and not ever to stop to sniff anything. But the training ahead for Bapin and Dinah is designed to “wash out” any student or dog who cannot work as a team with mutual trust. A test comes when Keith drives Bapin and Dinah to the nearby Oakland University campus and, under his watchful eye, has them walk an obstacle course of winding sidewalks, student-filled hallways, elevators, and multi-level stairwells. It prepares Bapin and Dinah for any future days at his University of Arkansas campus. Bapin and Dinah begin to bond, a process that normally takes ten days for a blind person with a Leader dog but up to 21 days for a deaf-blind student because the dog never hears any voice command from its master. 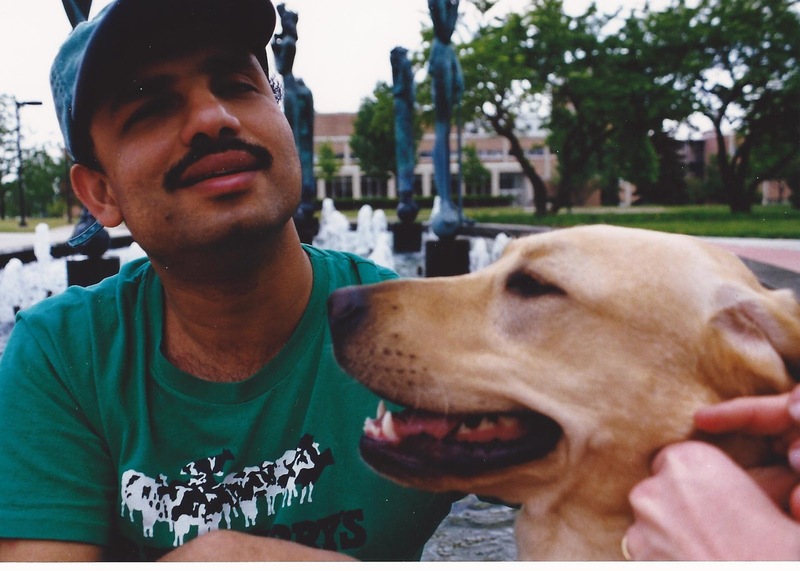 A deaf-blind person’s relationship with his dog, however, is stronger, like that of a father and son, Keith says. Though fast becoming friends, Bapin and Dinah face a more severe test. It comes during the last training week when Keith drops off Bapin and Dinah in downtown Rochester and tells them to take an hour’s stroll by themselves. Keith stays in the van, always a block or so away. A dog wants certainty and “is no friend of indecision,” writes author McMains. An hour later, Keith drives ahead to wait for Bapin and Dinah at the school’s satellite training center in downtown Rochester. He has just finished signing “congratulations” to Ken, who waits inside with Skinner. Bapin and Dinah soon round the corner. Without any previous mapping or compass direction from Keith and with only their super-keen sense of orientation, Bapin and Dinah finish their stroll of many zigs and zags and walk quickly, assuredly right up to the front door. Ken’s own moment of pain comes during the training came two days before “graduation.” It is his birthday, and all day he sits morosely alone in his room with Skinner. That night Keith and two colleagues bring Ken a birthday cake. Ken smiles and weeps. At 6 a.m. on June 4, 1998, Bapin, Dinah, Ken, and Skinner — along with several other blind student and dog graduates, board the school bus for an hour-long drive to the Detroit airport. The conversation is charged with celebration, subdued but profound. Keith and the other two trainers on board are sharing equally in this event as the driver slides in a Jimmy Buffett cassette and then pulls away. Bapin and Ken exchange humorous stories on past challenges such as learning how to clean up after their dogs in the outside run. Then they talk, or sign, a bit about their dinner last night at the Rochester Lions Club and their recent fun at the fund-raising carnival sponsored by the 25-year-old club. Bapin and Dinah enter the plane and stride confidently down the aisle. Bapin takes his seat, buckles in, and reaches down to reassure Dinah that all is okay.